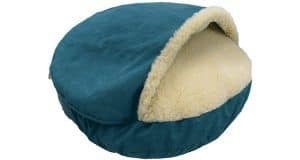 Home Best buy guides Best heated dog beds available in 2018! Heated Dog beds provide warmth to your dog’s body keeping them comfy even on the cooler days. Dogs love the warmth and comfort that heated dog beds provide rather than the chilly, cold and hard floor. Whatever your dog size or budget there will be something to meet your needs, keeping your pet comfy and cozy even on chilly days. Here are the best heated dog beds available on the internet today. 5 Sizes & Colours Available to suit most Pets & Homes. This amazing self-heated dog bed is in designed in 2 sizes. Fleece covered, rugged pad comes in three different sizes. Keep reading to find out more about each of the entries above! 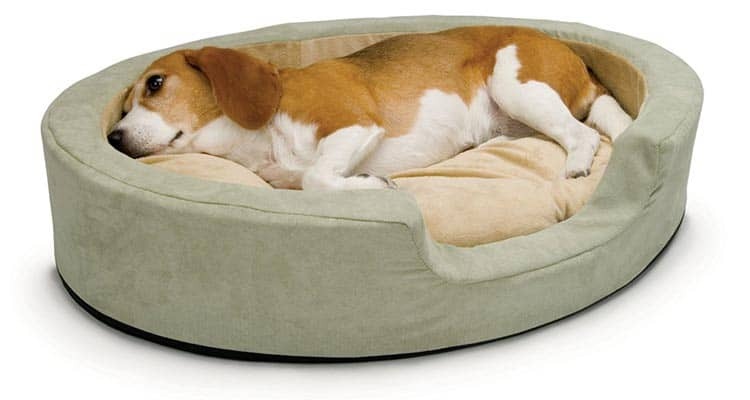 Heated dog beds are exceptionally popular and widely owned and used. They provide gentle heat, and comfort to fight off cool and chilly weather. Having a dog bed, particularly one with heated features can provide even more benefits to your beloved canines. 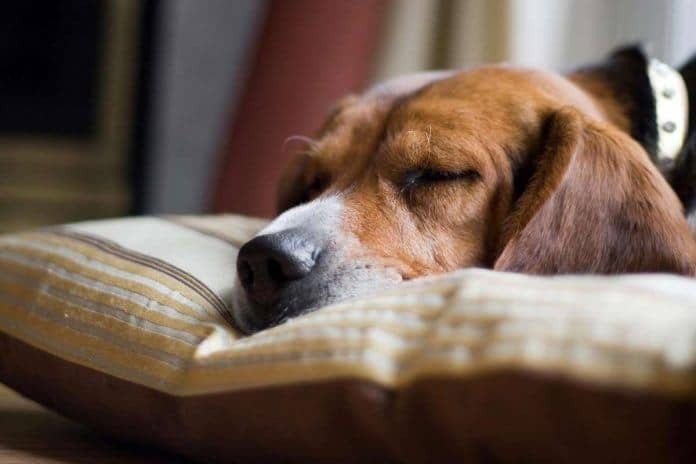 Arthritis, for example, a common health problem, especially in elder or senior dogs, can be alleviated by having a heated dog bed helping soothe your canine’s stiff joints and relax its muscles for sound sleep. Likewise, the bed also promotes blood circulation and helps improve flexibility. security, and the right amount of heat that your smaller canines needs, while altogether providing therapeutic welfare to newborn puppies and injured pets. What to look for when choosing the correct heated dog bed? For something that is widely held as a novelty item, there are a wide array of features that can make a heated dog bed better or worse for your canine. It is of vital importance to keep in mind all of these considerations when making your purchase. The best approach would be beginning by asking yourself a couple of simple questions so as to accurately pinpoint what you need and choose the correct heated dog bed for your canine. How big is your dog? The first consideration in purchasing the perfect heated dog bed for your furry companion is your dog’s size. Find a bed that is the right size for your canine friend and that which they can perfectly fit into. The right bed size will do a lot of good to your furry friend and prove to be a worthwhile investment. Do you need it for indoor or outdoor use? Another consideration in choosing the correct heated dog bed for your furry friend is whether you need it for indoor or outdoor use. It is important to keep this mind since some heated beds are designed to be able to withstand outdoor use while others are for strictly indoors. What does your dog like? When buying a heated dog bed, your dog’s comfort is the most significant consideration after size. Heated dog beds can come in a variety of configurations, so it is important to figure out what your dog prefers. Do they like sleeping in a regular “pad” type of bed? Prefer sleeping with a cover over their heads? Or do they curl up in one with sides? The right choice might just be the life-changing decision to your pet’s comfort. Is it washable? Owing to that, electricity and water don’t mix well and that dog beds tend to get quite nasty after heavy use, washable dog beds are particularly an attractive consideration. You will want one that is either generally washable or that which you can remove the electronics and clean it. This is especially important when it comes to indoor beds. Now that you’re helping your dog stay warm and snuggly, it’s also important to take care of their coat. 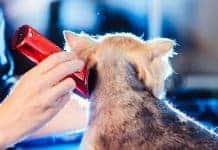 Ensuring your dog is groomed correctly also helps with their health and well-being. 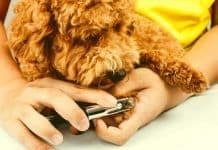 Check out our extensive roundup of the very best dog clippers available today by clicking here. We included clippers to suit all budgets and size of dog – we have reviewed corded and cordless. This amazing self-heated dog bed is in designed in two sizes, both large and medium, well made to ensure that it meets your dog’s needs. Pets like to cozy up and get comfortable as they sleep. But as it is evident, they need more than just a little warm during cold long night’s sleep, since regular beds (especially when it comes to hairless or tiny dogs) just won’t suffice and that’s where the K&H Manufacturing Thermo-Snuggly Sleeper comes in. This cozy indoor dog bed excels as a splendid example of an exceptional interior dog bed, with its soft neutral tones making it a great addition to any room without spoiling the aesthetics. The lowered front of the bed allows for easier access even for shorter dogs. And since the bed utilizes only six watts of power, you will be glad to know it won’t sent your electricity bill soaring. Adding to the fact that the cushion and heater are removable for easy cleaning, the K&H Manufacturing Thermo-Snuggly Sleeper indeed is a winner for an indoor heated dog bed. Moreover, the thermal bed comes with a year-long warranty, ensuring that if something happens within the first year of use you will be able to get it easily and quickly replaced. OR ANY OTHER JOINT OR PAIN PROBLEMS. If you have a canine who is more often outside in the cold, K&H Manufacturing Lectro-Soft Outdoor Heated Bed may just be what you are looking for. 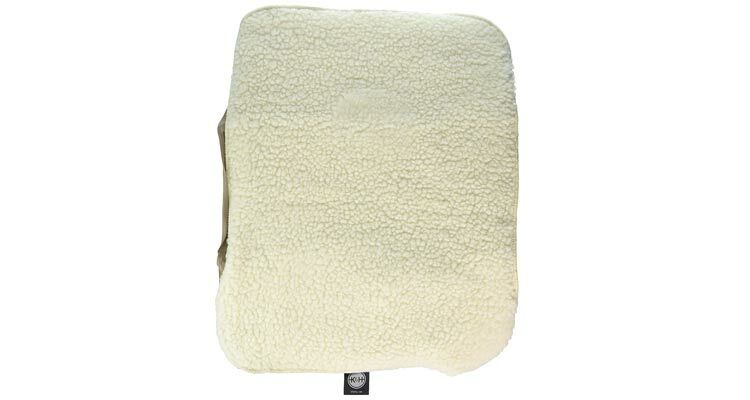 This fleece covered, rugged pad comes in three different sizes designed to perfectly fit your pet. Alongside the differing sizes, the bed also comes in different variations made to offer additional features such as user-adjustable thermostats and igloo-style covers. 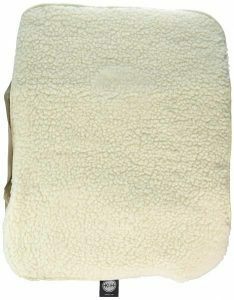 These pads are tough, soft, and cozy making them a delight to your dog once they are acclimated to it. Moreover, the pad is made of orthopedic foam underneath its covers, making it a ridiculously comfortable pad your pet is sure to love. The cover to the bed is machine washable, and therefore you will be able to clean off the plastic cover on the foam pad easily using just water and a sponge. It is however advised to be sure to let it fully dry before turning it back on. And like most of the K & H Manufacturing products, the bed is covered by a one year warranty, allowing for easy replacement in the event of failure. While Sheri Pet Igloo might flair in innovation, the Snoozer Cozy Dog Cave features more sizes and is particularly perfect especially for certain dog breeds that delight in burrowing under blankets. The wide variety of Snoozer Cozy Dog Cave sizes mean that any dog breed will be able to comfily make itself at home within the confines of the bed. The Snoozer Cozy Dog Cave comes is unique in design and alludes in a variety of color schemes whether in a brown and white, or red and white, all are perfectly designed to fit in with your home décor, with an outstanding aesthetic and heartwarming appeal especially with your furry companion poking its head form the cave to peek a look around. 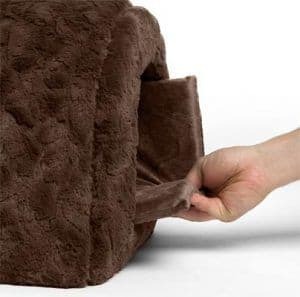 Moreover, the Snoozer Cozy Dog Cave is easily washable since the cover unzips, and thus you will be able to clean it when it gets soiled. And thanks to its faux-lambskin interior, you can stay assured that your dog will be both warm and comfortable while it lies down within. The Sheri Pet Igloo is an innovative dog bed product with warming material made into a cozy dog cave which pets love and is perfect for dogs which need a little privacy while resting. This self-heating dog bed comes in six appealing colours to choose from, one of which is sure to amicably fit in with your home décor. The entire construction is made of a flexible but durable material designed to be long-lasting and is machine washable. 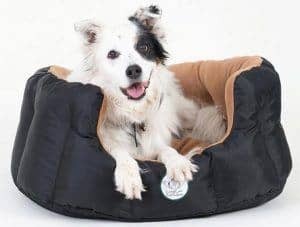 Made from Oxford fabric, the dog bed is water resistant and the floor pad is removable allowing for cleaning in the event of an accident or spill. This self-heating and comfy dog cave are perfect for small and nervous furry companion who want to keep themselves warm in cooler months or cold nights. On the downside, however, the Sheri Pet Igloo comes in only one size, but if it is the perfect fit for your pet, you may just have found the perfect remedy for your pet for freezing nights. The Ultra Supreme Pet Bed, is one of the best heated dog beds if your ultimate purpose is to pamper your beloved canine. The Loving Care Pets Ultra Supreme Pet Bed comes in five different sizes making it a suitable pet bed for almost any breed of dog you might own. The Loving Care Pets Ultra Supreme Pet Bed looks amazing on top of being functional. The black and brown coloring in its design is deep and rich, well-fitting to almost all home décor. The pet bed is also durable in construction and is resistant to almost any kind of stain or accidental spill your dog will throw at it, be it water, urine or oils. 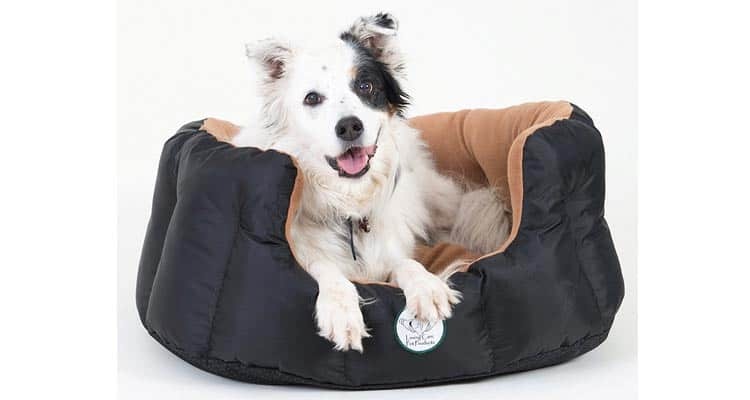 Moreover, the thick plush pads of the pet bed are removable and reversible, making it easier to clean and a bit cooler during the warmer winter months. If you are looking to pamper your pet with the best puppy or dog bed around, then the Loving Care Pets Ultra Supreme Pet Bed might just be the option for you. And thanks to its high-quality durable construction, as well as resistance to stains and fluids, your investment will last for years and years, with your canine enjoying an amazingly soft and cozy bed to lay their head. THIS CONCLUDES OUR BEST HEATED DOG BEDS ROUNDUP! Heated dog beds provide the warmth and comfort to fight off cold nights and chilly seasons. Making the leap to purchase either a thermal dog bed or a self-heating one for your furry companion will be a treasure that your dog will absolutely fall in love with. 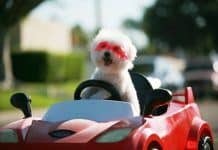 You will know you have made just the right and informed purchase when your beloved canine spends as much time in his bed as you wish you could in yours, altogether making both of you happy and contended. So, whether it’s planning for cold weather, arthritic joints, or just to keep your family’s newest furry addition nice and warm, you are sure to find your hearts appeal in the delighting and exciting world of heated dog beds.